Right from birth humans have a natural preference for sweetness which in most cases doesn’t go away. We are bombarded with sugar in just about everything. From yoghurt to cereal, tomato sauce to packaged foods, if you look at the list of ingredients you will likely find a form of sugar. Words to look out for in labelling include words ending in ‘ose’ like sucrose, dextrose, fructose, glucose, maltose, lactose, as well as maltodextrin, corn syrup, high fructose corn syrup and of course sugar. When we think of where sugar might be hiding we tend to think of the obvious things like cake, biscuits, sweets, desserts, etc, but don’t forget liquid sugar. The worst offender is probably fizzy drinks. One 330ml can of Coca Cola contains around 10 teaspoons of sugar! 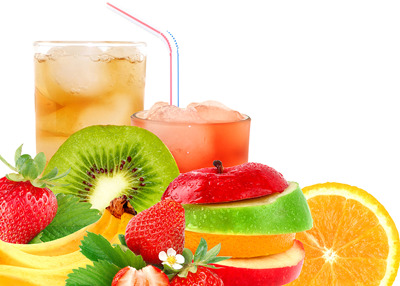 Then we have fruit juice, sports drinks, so called ‘energy’ drinks and of course alcohol. Don’t be fooled by so called healthy juices from juice bars, they can easily contain over 50g of sugar per serve. This isn’t added sugar, but sugar from fruit. Think how many apples or oranges you have to squeeze to get a large glass of juice. You wouldn’t sit down and eat that many pieces of fruit in one go, but how easy is it to drink juice? Dried fruit is a very concentrated form of sugar, so if you are trying to reduce the amount of sugar in your diet, keep away from dried fruit. As far as fresh fruit goes, the sweeter the fruit then in general, the higher the sugar content. Think melons, pineapple, grapes and dates. Better options are apples, pears and berries. There is no difference between ‘healthy sugars’ like agave, honey, etc when it comes to calories. Sugar is sugar! One teaspoon (5g) of sugar contains around 20 calories. 20 empty calories that offer no nutritional benefit to our body. If you enjoy sugar in your tea or coffee or on your cereal, try having a little less until you downgrade your tastebuds. If you currently have 2 teaspoons of sugar in your coffee, try one teaspoon, then ½ teaspoon and so on, until you adjust to the different taste. If you enjoy milk chocolate try 70% cocoa chocolate instead. Milk chocolate is 55% sugar, 70% cocoa chocolate is around 27% sugar and 85% cocoa chocolate is around 13% sugar. The higher cocoa chocolate also contains antioxidants which are actually beneficial to your body, but 10g-20g of high cocoa chocolate is a serving, not a block! Sugar offers no nutritional benefits, in fact it can be detrimental to health by lowering other minerals in our body if you consume too much. Sugar causes inflammation and it causes spikes in blood glucose levels meaning higher amounts of insulin need to be released. Insulin is a fat storage hormone, so not only do the calories from sugar count, but the physiological action it has on our body adds to fat storage. Sugar feeds cancer cells and elevated insulin levels assist cancer cells to grow. There really is nothing healthy about sugar so look for ways to reduce it in your daily diet. Eat fresh, real food and keep away from packaged and processed foods, as well as liquid sugar.